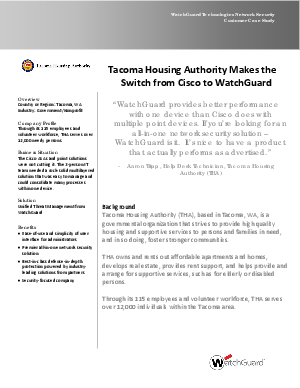 Tacoma Housing Authority (THA), based in Tacoma, WA, is a governmental organization that strives to provide high quality housing and supportive services to persons and families in need, and in so doing, foster stronger communities. Through its 115 employees and volunteer workforce, THA serves over 12,000 individuals within the Tacoma area. With just a three-person IT team to support an organization spread over 10 buildings that serves a sizable community, manpower and budget-consciousness are top-of-mind when tackling security and networking challenges. According to Aaron Tripp, Help Desk Technician at THA, "Network attacks today seem to be trickling down more to small and medium-sized businesses because cybercriminals probably figure we don't have the manpower and huge budget to keep everything secure. Read on to learn how Watchguard provided unified threat management that provides easy-of-use for the administrator.